*Article was first published in July 1988 by Jerry Wright and Extension Agronomists, Leland Hardman & Michael Schmitt. Determining the amount and timing of the last few irrigations of the season is one of the most critical water management decisions. Discontinuing too early in the season to save water or reduce pumping cost could mean a much greater reduction in yield returns than the cost of pumping. On the other hand, irrigating right up to crop maturity may mean using 1 to 3 inches more irrigation water than necessary and increasing operating costs $3 to $15 per acre depending on power source. 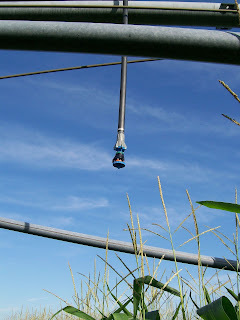 The purpose of this article is to present some guidelines for predicting the last irrigation for corn and soybeans when irrigation water supplies are adequate. To provide adequate soil moisture in the root zone to carry the crop to maturity without reducing yields. To deplete the soil moisture farther than normal (i.e., 60-70% of available water can be depleted at maturity) when nearing maturity. This will minimize irrigation water supply needs, fuel and labor for the season and allow the off-season precipitation to recharge the soil profile. These requirements may appear to be conflicting, but the problem can be solved rather easily if adequate field information is available or is predictable. The following field information is necessary to predict the date of the last irrigation. Record the date, field, crop, soil type, and the crop growth stage. The soil type information can be obtained from the NRCS Web Soil Survey and Tables 2–3 can be used to determine the crop growth stage. 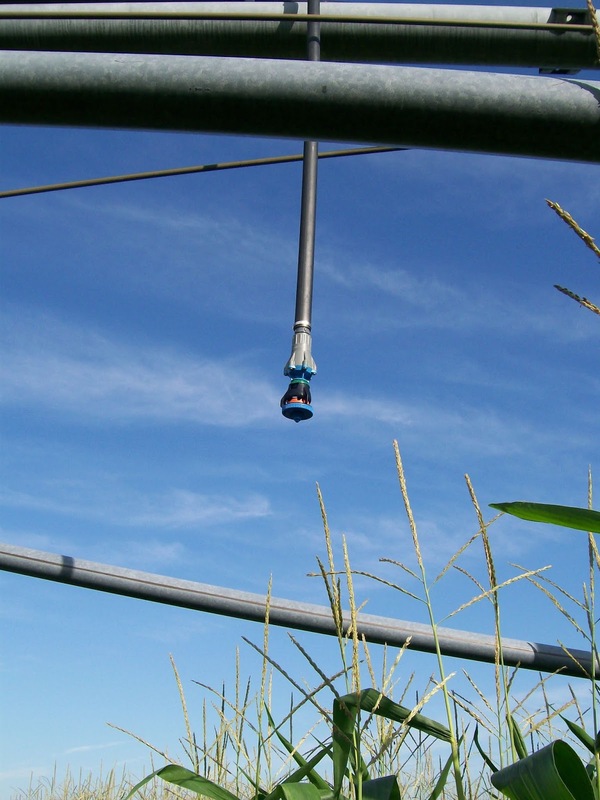 Determine the water use by the crop to reach maturity (WUCM). Table 4 presents the approximate water use at particular growth stage to reach maturity. Determine the allowable soil moisture deficit (ASMD) for the soil listed in step 1. The ASMD values for different soil types are presented in table 5. Measure the current soil moisture deficit (CSMD). Calculate the remaining useable soil moisture (RUSM) in the rooting zone by subtracting CSMD from step 4 from ASMD found in step 3. Calculate the irrigation water requirement (IWR) by subtracting the remaining useable soil moisture found in step 5 from water use to crop maturity found in step 2. If the remaining useable water (step 5) is greater than the water use to crop maturity (step 2), then no irrigation is required. Detailed description of how to calculate various parameters in table 1 is described below. Table 1. Estimation of the last irrigation requirement form. 6. Irrigation water requirements in inches (IWR). Assumes no rain. *If line 5 is greater than or equal to line 2, no more irrigation is needed. Table 2. Corn reproductive growth stages. Blister (R2) 10-12 days after silking. Kernel is visible and resembles a “blister” filled with clear fluid and embryo is barely visible. Approximately 85% moisture content. Milk (R3) 18-20 days after silking. Kernel is colored yellow with the inside containing “milky” white fluid. Kernel moisture content is approximately 80%. Dough (R4) 24-26 days after silking. Interior of kernel has thickened to a dough or paste-like substance. Kernel moisture content is approximately 70%. Beginning dent (R4.7) Kernels begin to dent at the base of the ear. 3/4-milk line (R5.75) 31-33 days after silking. Kernels dented at kernel top with the “milk line” separating the liquid and solid (starch) portions. Within R5 stage, kernels are often staged according to the progression of the milk line; i.e. ¼, ½, and ¾. Table 3. Soybean reproductive growth stages. Beginning seed (R5) Seed is 1/8” long in pod at one of the four uppermost nodes. Table 4. Estimated normal water requirements for corn and soybeans between various growth stages and maturity in central Minnesota. Table 5. Available soil water capacity and allowable soil moisture deficit at maturity for several irrigated soil in Minnesota. Corn and soybean plants require some moisture right up to the time of maturity. However, with shorter and cooler days towards the end of the season, crop is using less water thus required less water than rest of the season per day. Since some of the required moisture near the end of the season can be obtained from the soil moisture reservoir, the last irrigation can usually be applied two to three weeks prior to physiological maturity depending on the soil's water holding capacity. To estimate the number of days left to reach the maturity and water use by crop until maturity, knowledge of crop growth stage is very important. Maturity of a crop is defined as the time when the kernels or seeds have reached maximum dry weight. For corn, a black layer formation at the tip of the kernel is the normal indication of physiological maturity. This occurs approximately 7 days after the kernel has reached the 1/4 milk line. For soybeans, beginning maturity is generally identified when one normal pod on the main stem has reached its mature yellow or brown color. Tables 2 and 3 of this article describes the reproductive growth stages of corn and soybeans. A more detailed information about the crop growth can be found in the source provided at the end of each table. Table 4 shows the estimated water requirements (ET) between a given growth stage and maturity for corn and soybeans for central Minnesota under normal climatic conditions. These estimates were calculated by using normal crop development rates for 95 RM corn and central soybean maturity zone and normal water use patterns for central Minnesota. The available water holding capacity (AWHC) of different soils is different. It is a function of soil texture, soil structure and organic matter of the soil. It is the soil moisture (water) that can be extracted and used by plants. Available water holding capacity (AWHC) is the amount of water the soil holds between the upper limit, i.e., field capacity, and the lower limit, i.e., permanent wilting point. To determine the total available water (TAW) in the root zone depth, the AWHC is multiplied by root zone depth (RZD). Once we determined the ASMD and the CSMD, the remaining usable soil moisture (RUSM) in the root zone can be calculated by subtracting the current soil moisture deficit (CSMD) from the allowable soil moisture deficit (ASMD) at maturity. Note: If IWR is negative that means no irrigation is needed. *Adapted from Bockstadter and Eisenhauer paper presented at Nebraska Irrigation Shortcourse, February, 1988.